1819 Entire from New York to Glasgow 'P Sarah' showing a fine step-framed GREENOCK/SHIP LETTER, Robs S9. 1838 Entire from the SHETLAND BANK, LERWICK addressed to Edinburgh and showing a very fine oval-framed SHIP LETTER/19 MR 1838/LEITH IN BLUE, Robs S6. 1879 1d Rose-Red, SG 43, Plate 131, tied to envelope to Edinburgh by a Greenock 163 duplex, showing a very fine oval 'POSTED ON BOARD/LORD OF THE ISLES/STEAMER' cachet in violet. RARE. 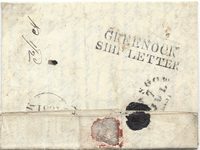 1872 1/- Green, SG 117, Plate 5, O-G, tied to envelope addressed to Mexico "via Southampton" by a very fine BEAULY '39' duplex and showing a Mexican handstruck '4' Charge. 1909 ½d Yellowish Green, SG 218 tied to postcard to Castleford by a superb GK & ARDRISHAIG PACKET/COLUMBA cds, Code 'A' Morning. 1907 Postcard to London showing a very fine "R.M.S. LORD OF THE ISLES" Steamer Cachet in Black - Scarce in Black. 1905 Postcard to Glasgow showing a very fine "R.M.S. LORD OF THE ISLES" cachet in violet. 1904 ½d Blue-Green, SG 216, tied to postcard to Winsford, Cheshire, by a fine G.K. & ARDRISHAIG PKT/+/COLUMBA cds. 1911 Postcard from Greenock to Leigh, Lancs showing a very fine R.M.S. "LORD OF THE ISLES" cachet in violet. 1801 Entire from New York to Dingwall showing an oval-framed SHIP LETTER/crown/GREENOCK, Robs S4, in Red. Very Scarce. 1911 1d Scarlet, SG 219, tied to envelope to London by a very fine Type 9 GK & ARDRISHAIG PACKET/COLUMBA circular datestamp, Code B, Afternoon. Ex Robertson Collection. 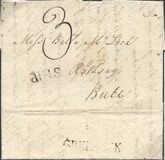 1777 Entire FROM JAMAICA addressed to ROTHSAY, ISLE OF BUTE showing a fine "GREENOCK" and "SHIP", Robs S1. An unusual port of arrival for mail from the WEST INDIES.